The suspect in Wednesday's shooting at the Family Research Council has been ordered held without bond following a brief hearing. 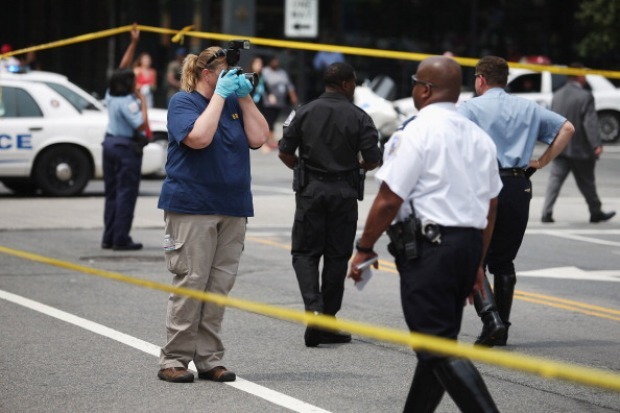 Floyd Lee Corkins II, 28, of Herndon, Va., is accused of shooting a security guard in the lobby of the conservative Christian organization based in downtown D.C.
On Thursday afternoon, he was led into a courtroom at the at the U.S. District Court for the District of Columbia wearing a disposable jumpsuit. He testified that he had no assets except for $300, and was assigned a public defender,NBC4's Jackie Bensen reports. During the hearing, the judge granted a request by the prosecution that Corkins undergo a mental health evaluation. 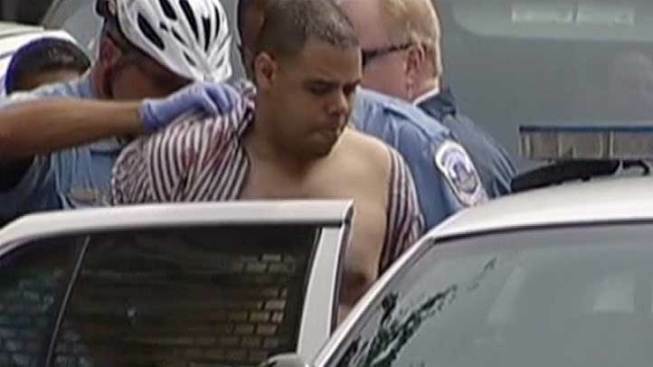 Authorities say a security was shot stopping a gunman at Family Research Council in downtown D.C.
Corkins has been charged with assault with intent to kill while armed, and interstate transportation of a firearm and ammunition. The latter is a federal offense. Following Wednesday's shooting, authorities found 50 additional rounds of ammunition in the suspect's backpack, as well as 15 Chick-fil-A sandwiches, a law enforcement agent said in an affidavit. EXCLUSIVE: Family Research Suspect Investigated in Va. 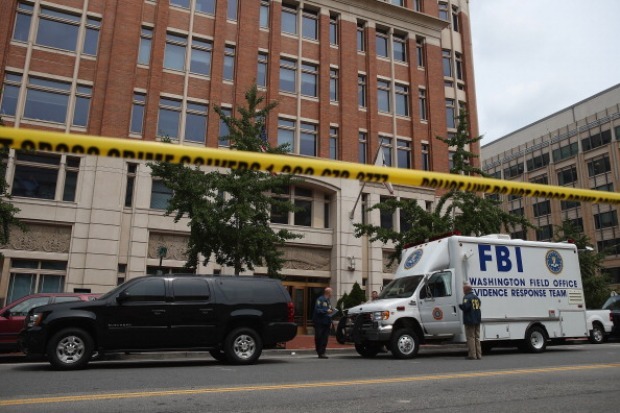 The investigation into the shooting of a security guard at Family Research Council in downtown D.C. sent FBI agents to the East Falls Church Metro Station and a home Herndon. Fast food empire Chick-fil-A has been at the center of a recent controversy over gay marriage after Chick-fil-A President Dan Cathy spoke out against it. The Family Research Council promotes traditional marriage and other issues, lobbying against gay rights, abortion and embryonic stem cell research. Its president, Tony Perkins, came out strongly in support of Chick-fil-A's president, NBC News justice correspondent Pete Williams reported. The Family Research Council gets money from the company that owns Chick-fil-A. Corkins is expected back in court on Friday, Aug. 24 for a preliminary hearing and detention hearing. Authorities say Corkins entered the building at 801 G Street NW at around 11 a.m. Wednesday. He approached the front desk and said he was an intern. NBC News justice correspondent Pete Williams on the developments in the shooting at the Family Research Council. Security guard Leonardo Reno Johnson, 46, questioned the man and asked about the contents of his backpack, which is when the shooter pulled a Sig Sauer 9 mm handgun from the backpack and fired several rounds, striking Johnson in the arm. According to a witness, the shooter also made a negative reference about the work of the Family Research Council before opening fire -- something to the effect of, "I don't like your politics," a law enforcement official said in an affidavit. Despite his injury, Johnson wrestled the gunman to the ground, gained control of the weapon and held it on the suspect. A second security guard called 911. 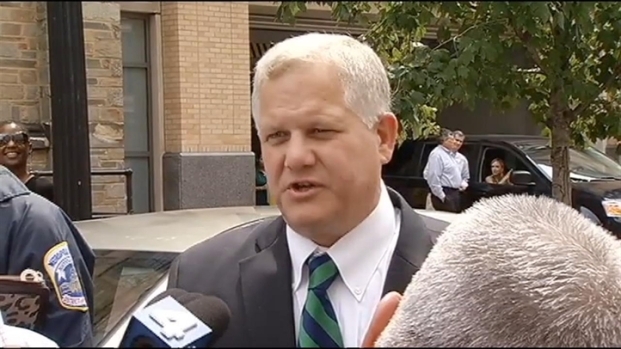 Authorities update the media on the shooting at the Family Research Council. Johnson is in stable condition at a local hospital. Authorities called him a hero for wrestling the gun away from the shooter and preventing him from hurting anyone. Johnson's mother, Virginia Johnson, told the Associated Press she hasn't yet been to visit her son, but she spoke to him Thursday morning by phone and that he "feels very well." 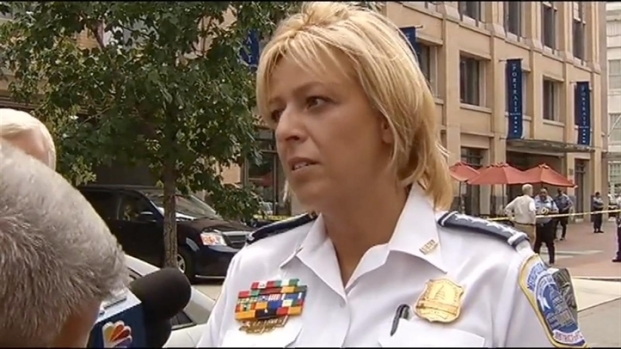 MPD Chief Cathy Lanier addresses the media about the shooting of a security officer at the Family Research Council. She said she assumed her son was the victim as soon as she learned about the shooting, and that she's proud of him for helping to subdue the gunman. The gun used in the shooting was purchased legally in Virginia five days ago, Williams reported. Corkins apparently parked his car, a 2004 Silver Dodge Neon, at the East Falls Church Metro station and took Metro downtown. FBI agents photographed a silver Dodge Neon with Virginia plates at the Metro station and had it towed from the lot, NBC4's Jackie Bensen reported. Four boxes of additional ammunition was found in the car, sources told NBC4. Authorities also went to the Herndon home where Corkins lives with his parents. They told agents that Corkins has "strong opinions with respect to those he believes do not treat homosexuals in a fair manner," according to the affidavit. The FBI also went door-to-door interviewing neighbors Wednesday, several of whom spoke highly of the family. "They were always so sweet and so nice," said Stephanie Meyer, who lives a few doors down. "They are awesome people. We never had any issues." According to a U.S. Defense Department official, Corkins is not a member of the Air Force, but he may have lived at Andrews Air Force base in some other capacity in the past, possibly as a dependent or family member. The official spoke on condition of anonymity because the official was not authorized to provide personal information. Corkins had been volunteering at the D.C. Center for the LGBT Community, the Associated Press reported. "I was shocked to hear that someone who has volunteered with the DC Center could be the cause of such a tragic act of violence," said Executive Director David Mariner. "No matter the circumstances, we condemn such violence in the strongest terms possible." Mariner described Corkins as “kind, gentle and unassuming," and said Corkins had been volunteering there for about six months. 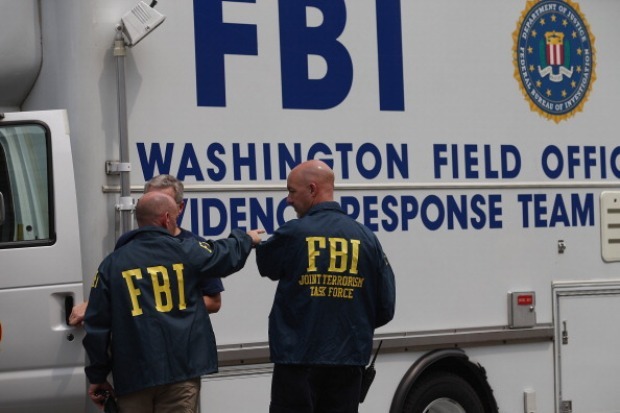 The FBI and the Metropolitan Police Department are investigating the case jointly. They are working with the U.S. Attorney's Office to determine if this is a federal or local crime. ATF agents also went to the scene, NBC4's Derrick Ward reported. Amy Biondi and her husband Steve were visiting Washington from Long Island with their daughter and a friend and tried to ask officers for help with a parking meter when they were told there was a situation they had to deal with. The door to the FRC was open, and an officer could be heard repeatedly shouting, "Put the gun down, put the gun down." "Next thing you know there are police officers swarming the area," said Biondi, 45, a massage therapist from St. James, N.Y. The family didn't get a close look inside, but they said the man that officers were talking to seemed to comply immediately. Groups aligned with conservative causes lambasted the shooting, but so did a coalition of about two dozen organizations promoting gay, lesbian and transgender rights, which said it rejected and condemned the attack. "Our first concern is with our colleague who was shot today," Family Research Council President Tony Perkins said Wednesday. "Our concern is for him and his family." White House spokesman Jay Carney said that President Barack Obama, who was traveling in Iowa Wednesday, was informed of the shooting shortly after 1 p.m.
"The president expressed his concern for the individual injured in the shooting and his strong belief that this type of violence has no place in our society," Carney said. Republican presidential candidate Mitt Romney said in a statement that he was appalled. "There is no place for such violence in our society," he said. "My prayers go out to the wounded security guard and his family, as well as all the people at the Family Research Council whose sense of security has been shattered by today's horrific events." More than two dozen LGBT organizations released a joint statement Wednesday saying, "The motivation and circumstances behind today’s tragedy are still unknown, but regardless of what emerges as the reason for this shooting, we utterly reject and condemn such violence. We wish for a swift and complete recovery for the victim of this terrible incident."